Isn't it crazy that it is already almost Thanksgiving? My absolute favorite time of the year is coming up and I can't wait! (Not that I haven't already started celebrating). I would be lying if I told you I haven't already watched hundreds a few Christmas movies, am about half way done with my shopping, and contemplated decorating the house three or four times. I decided to contain myself, I will decorate on Black Friday and Saturday, after my shopping. We are having Thanksgiving at my house this year, I am a perfectionist when it comes to decorating, especially for holidays, so I have been working hard on my Thanksgiving table (check back for pictures later). 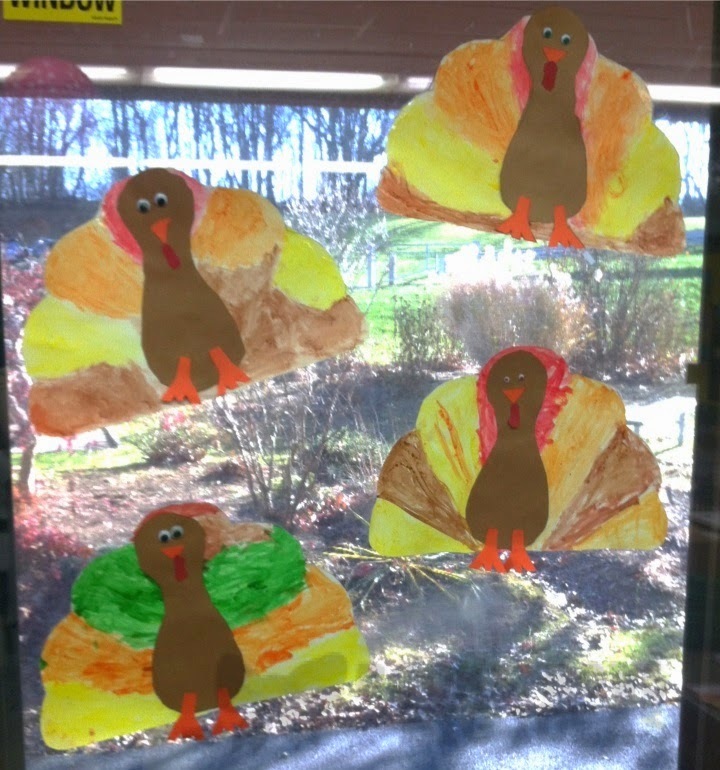 We have been doing quite a few Thanksgiving themed activities in kindergarten lately. I think our kids are getting a little bit sick of turkeys! 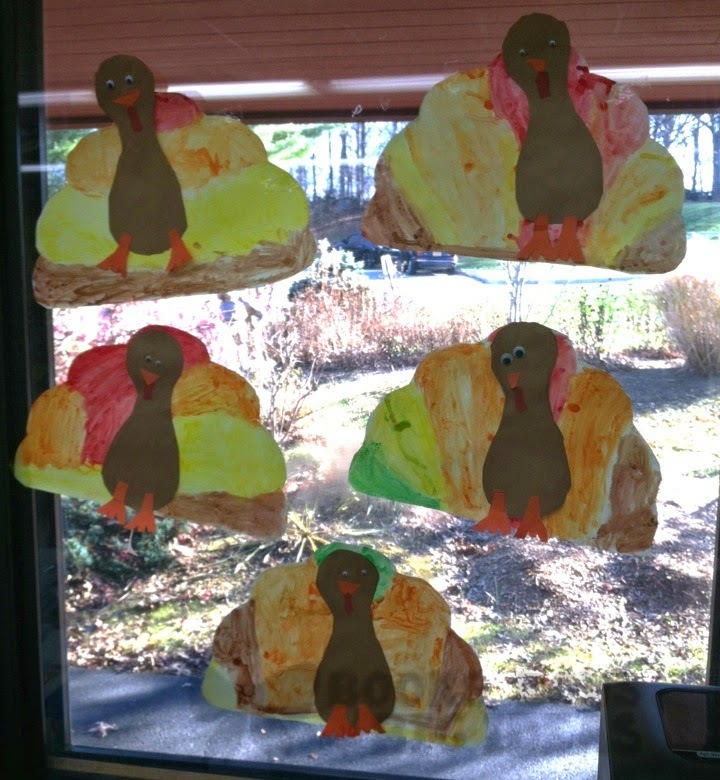 We had cute jack-o-lanterns on the windows for Halloween and replaced them with these adorable turkeys! 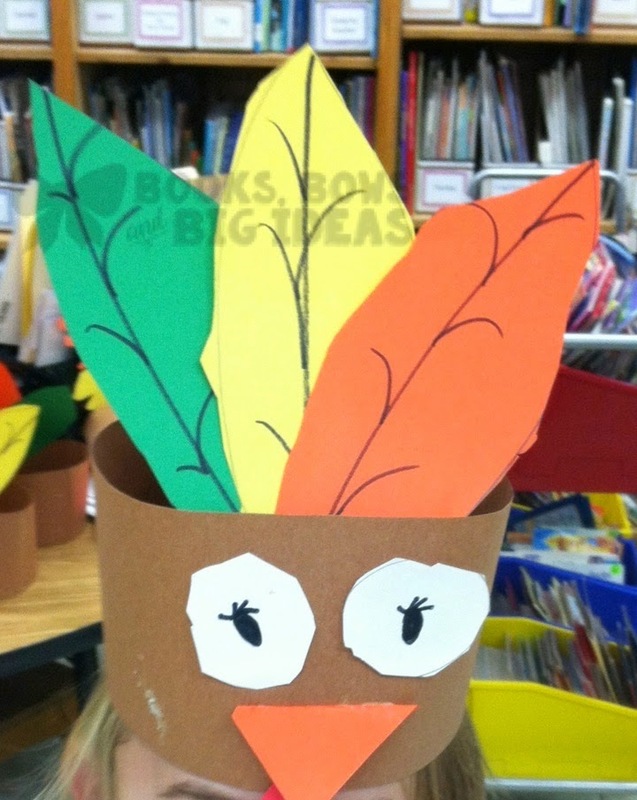 The turkeys are included in my Thanksgiving centers if you are interested in them. Click here to see my centers. I just had to post a picture of this one, it makes me laugh every time I see it! This little cutie cut all of her feathers out and then we glued them to back so that she wouldn't have to do it over. It looks like the turkey is getting an electric shock! 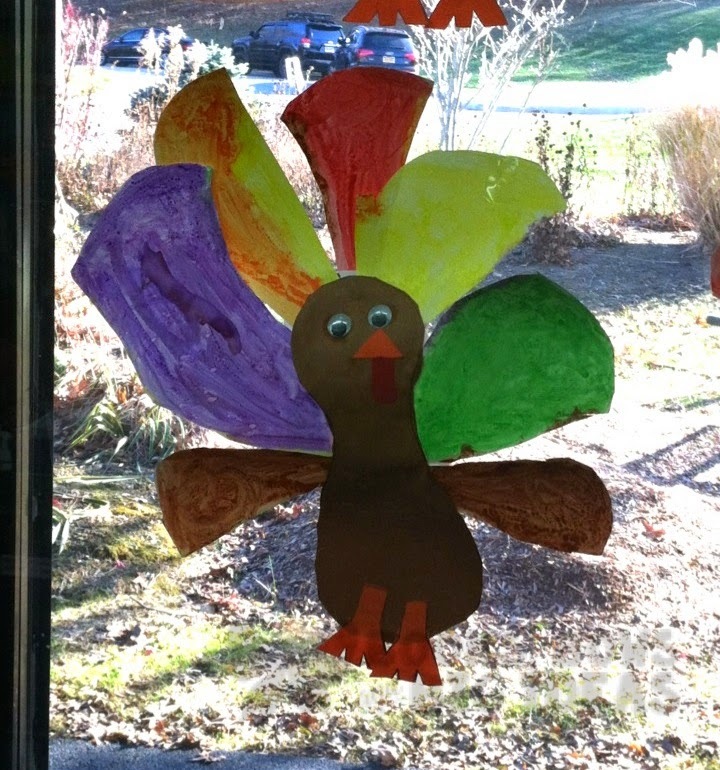 We also made these cute handprint turkeys. The poem is not mine. 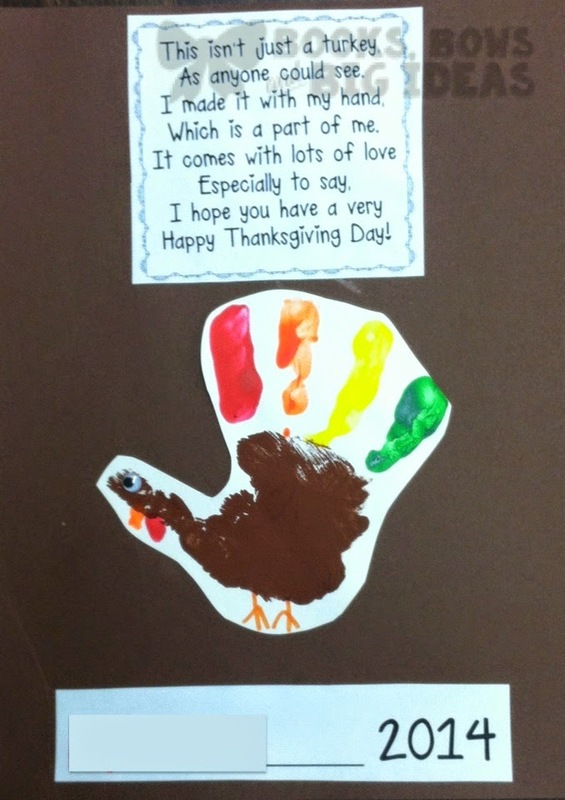 I am not sure who originally created the poem, but it is all over Pinterest and TpT. I just love the way they turned out. The best quote of the whole day was when I was painting a little boy's hand he says, "I've done this before, it was horrifying!". It was so funny! I don't know where he heard that. The kids wrote their names on the line. I just couldn't include it in the picture. 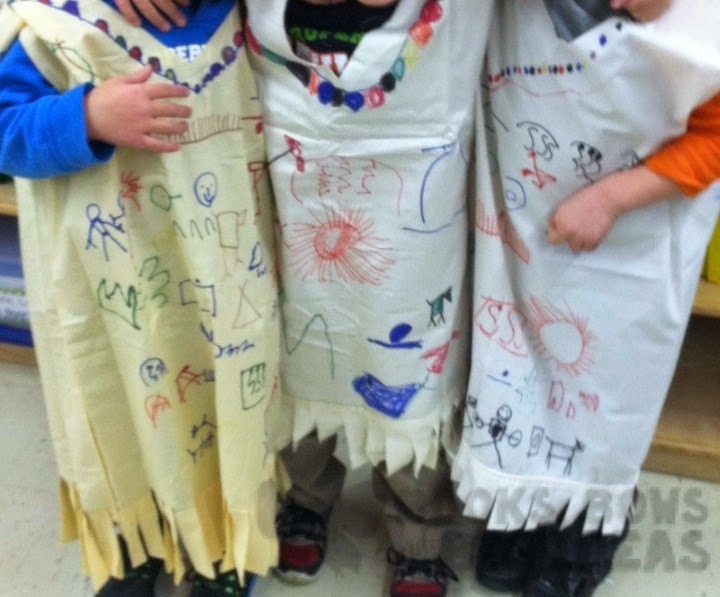 Every year we make Native American costumes with the class. This is something that is a lot of fun and looks really cute in the end. The kids each send in a pillowcase and we cut them to make it into a costume. Then, they use Sharpies to draw Native American symbols on them (not sure how accurate the symbols are, but we have a sheet with the symbols that are pretty age appropriate and easy to draw). Usually we made dyed macaroni necklaces, but this year decided not to. 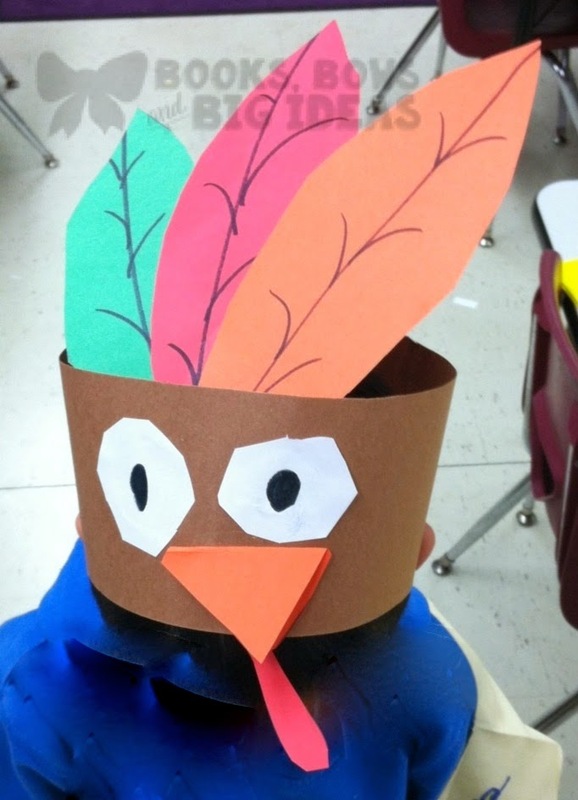 We also made these cute turkey headbands this year. 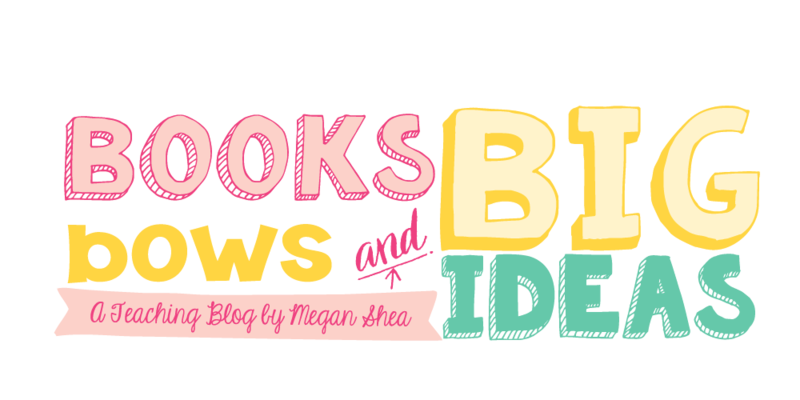 The idea came from Miss Kindergarten. They came out so cute! We will definitely be doing these again! Do your girls add eyelashes to everything also? Our girls always add eyelashes! We did all of these things this week so it wouldn't be too much next week. We still have Monday-Wednesday of school next week! We go all the way up to Thanksgiving every year. The good news is that I am done with my college classes until after Thanksgiving, so now I can focus on kindergarten and Thanksgiving!